Samsung didn't get the memo when Dell axed its 5-inch phone, because it has introduced its own 5.3-inch smartphone-tablet crossover called the Galaxy Note. The slender Android 2.3 device blurs the line between phones and tablets and comes with a bundled stylus for those who don't want to use their fingers. 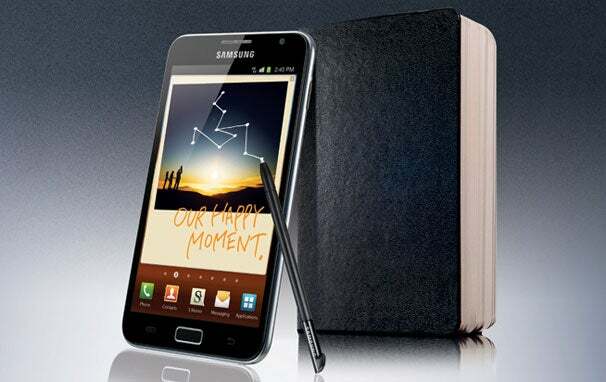 The Samsung Galaxy Note (whatever happened to the new naming convention?) sports some impressive features: It runs on an unspecified dual-core 1.4GHz processor; has 1GB of RAM; carries an 8-megapixel HD camera on the back and a 2-megapixel front-facing camera; and comes with either 16GB or 32GB of storage. The most astounding aspect of the Note is its screen. It's a 5.3-inch Super Amoled display with a resolution of 1280 by 800 pixels (that's 285 dots per inch--the iPhone 4 has 326 dpi). Despite the size of the display, Samsung managed to keep the Galaxy Note very svelte, stuffing all of the components into a 9.65mm-thin, 0.39-pound-heavy case. If gadget history is anything to go by, the Note will be another device with a 5-inch screen trying to be a phone and a tablet that won't catch on. Dell tried it with the Streak 5 and failed amid criticism that the device was too big for a phone, yet too small for a tablet. Android phone manufacturers are adding big screens to their phones, too, but usually up to 4.5 inches--still considerably smaller than the Note's 5.3-inch screen. Like the HTC Flyer tablet, the Galaxy Note comes with a stylus, which Samsung dubs the S Pen. The stylus works with a bunch of built-in apps, including calendar, to-do, and note taking. Third-party developers will be able to add S Pen functionality to their apps. Pricing will be an important factor in the Note's success. Will it be priced as a smartphone, or as a tablet? The Streak 5 was handicapped by its price, which was $100 more (with a two-year contract) than most smartphones ($199), and some $50 more (unlocked) than the cheapest iPad. Samsung hasn't said when or for how much the Galaxy Note will retail, but it has announced that it's working on two versions of the phone--one with HSPA+ and one with 4G LTE.